Since Motorola was acquired by a certain tech giant last year, its new owner hasn't had a particularly strong impact on the way it does business. Not too long ago, in fact, Motorola dealt another brag-hand of Droids, but there was something distinct about the Moto X that followed them. The first evidence of a change in direction, perhaps. 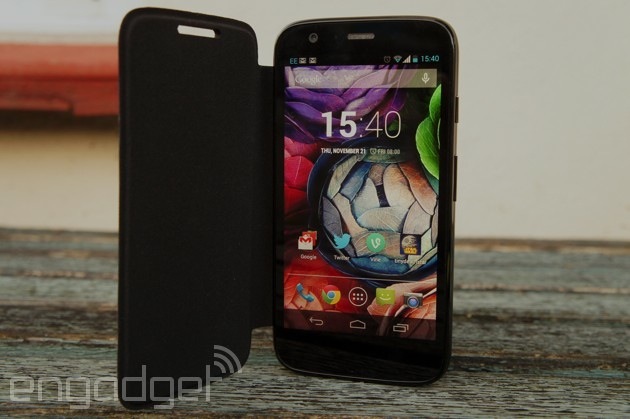 In the same vein, the recently announced Moto G feels very much like a Google phone, and it makes a ton of sense. If the Nexus 5 is for smartphone aficionados, and the Moto X is for upgraders who can't resist the offer of a custom handset, then the Moto G is for those who want a functional device at a reasonable price. At $179 or £135 unlocked, the Moto G slots into the low-cost niche Samsung and others have been steadily cashing in on. That price tag, however, includes an unwritten disclaimer: Sacrifices were made. It's certainly true with the Moto G, but with expectations in check, it's hard to not be impressed with what Motorola has managed to achieve. Forgiving the absence of a microSD slot and LTE radio, we commend the Moto G for its bright display, superb all-around performance and versatile camera despite a low megapixel count. At this price, it's a bargain. 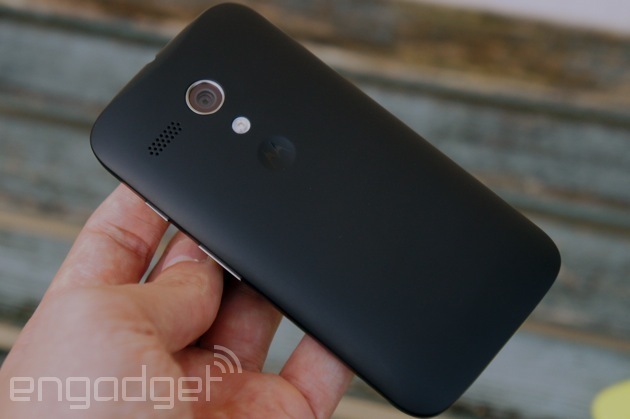 How would you rate the Moto G 1st-gen? Motorola isn't hawking the Moto G as some kind of cheaper Moto X variant, but it could have; the phones bear more than a passing resemblance to each other. Not that this is a bad thing: The X is a smart, clean handset. Phones aren't really described as "mobile" anymore, but the term truly does apply here. The Moto G is a genuinely one-handed device -- a refreshing change from 5-inch-plus devices we've been reviewing as of late. Its curved back rests nicely in the palm, and both the grippy matte cases and dimpled flip covers make for a comfortable design that's well suited to extended use. There are no physical or soft keys on the front face of the device. The standard Android home, back and multitask buttons will appear onscreen when needed, but otherwise the bezel below the 4.5-inch display is bare. The bezel above the screen, meanwhile, is home to a sunken, metal speaker grille, the front-facing camera and a small white notification light. As the Moto G's dimensions are similar to the X -- it's 0.6mm longer and wider, and 1.2mm thicker at its fattest point -- the slightly smaller screen means there's more blank space below the display. Still, this is more an observation than a slight -- the internal components have to go somewhere, after all. Around the outside, there's a blank left edge, and a power button and volume rocker on the right. Meanwhile, the primary mic and micro-USB port can be found on the bottom, with the secondary mic and headphone jack up top. The keys on the right edge protrude more than we're used to, but they do produce a nice, satisfying click. All detail on the rear cover sits toward the top edge. 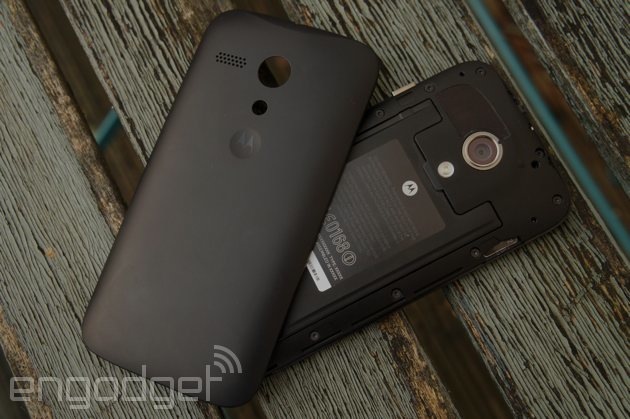 In descending order, you'll find the camera lens with the loudspeaker grille to its left above an LED flash, which, in turn, is above a small indentation framing the Motorola logo. That's where your thumb rests when prying the back panel off, if you follow Motorola's instructions (and you should). Nothing exciting awaits you under there: just a slot for your micro-SIM. While the Moto G doesn't offer the same level of personalization as the X does with Moto Maker, you can still choose from a range of shell colors that will hopefully expand over time. The same palette is available in flip covers, but the sheet of Gorilla Glass 3 covering the screen means they're a decoration rather than a necessity. Any loose set of keys looking to damage your G will have an easier time with the back panel, and our rubberized yellow unit took a minor dent or two, though they were barely noticeable. As we alluded to, the cases aren't easy to remove, even when you do follow Motorola's step-by-step instructions. It's a testament to the overall build quality, which wasn't compromised for the sake of the price. Aside from the volume rocker on our model testing positive for wobble, the 143-gram (5-ounce) Moto G feels better put-together than a number of more expensive phones built from similar materials. So far, no trade-offs of note for the money. Screen resolution often takes a hit in the name of cost savings, but not so on the Moto G. A respectable 720p resolution is spread lovingly across the 4.5-inch LCD display, working out to a screen density of 329 pixels per inch. Numbers aren't everything, though. What's the point of all those pixels if they're dull and off-tone? Fortunately, we don't have any such gripes with the Moto G's screen. Colors are intense; whites are white; and blacks are, well, actually black -- we had to double-check the spec sheet to make sure we hadn't misread AMOLED for LCD. Motorola insists on calling it an "edge-to-edge display," which doesn't really make sense. The auto-brightness setting is an accurate judge of how much power the display needs, and there's enough juice available to keep it working in direct sunlight. Viewing angles, too, are more than satisfactory, and the Gorilla Glass shield does a good job repelling fingerprint grease, even after long, sweaty sessions of Tiny Death Star. If you're partial to meandering through YouTube archives, or catching up with your favorite show on the train, you could do a lot worse than the Moto G. Motorola insists on calling it an "edge-to-edge display," which doesn't really make sense as the bezel width on either side is pretty standard, and thicker than some. The company last applied the phrase to its 2012 RAZRs, so let's just assume the marketing folks were running out of ideas, and move on. 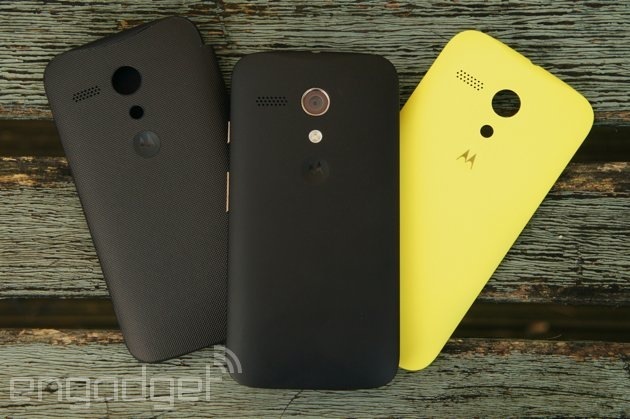 There's not a great deal to say about the Moto G's software, and that's a good thing. For once, we don't have to discuss the merits and drawbacks of TouchWiz, or explain why the new version of Sense is better than the last. The Moto G runs what's basically a stock build of Android 4.3 Jelly Bean, barring Motorola's boot animation and camera app. Also, an update to KitKat is only a few months away, at most. If you've never used a stock Android handset, it's not flashy (which often bodes well for performance), but it's also clean and functional. Furthermore, the G is preloaded with all of Google's services. If you use them, it'll save you time during the initial setup, and means you won't have annoying duplicate apps like browsers or music players. Unlike the Moto X, the G doesn't have any fancy specialized processor cores that the former's Active Display and Touchless Control features utilize. Our unlocked unit was thankfully bloatware-free, with only Motorola's Migrate and Assist software accompanying the stock apps. Migrate allows you to copy pretty much all data from another Android handset with the app installed to your new G. Assist will "learn" certain things about your routine and automatically change numerous settings as a result. For example, if you've a meeting plugged into your calendar, it'll engage a boardroom-friendly profile; similarly, it'll switch to silent mode when you're catching some Z's. Both sound useful enough, but if you're anything like me, you'll probably ignore them. You knew we were eventually going to come across something that reminds us of the handset's price, right? Well, here it is: there's no double-digit monsterpixel sensor here, nor any trademarked imaging technology. Nope, the G's main shooter is a modest 5 megapixels. The good news is: What the main camera lacks in resolution, it makes up for in versatility. It'll take some really nice shots in fairly unforgiving conditions. You probably know what we have to say about the 1.3-megapixel front-facing camera, as you've heard it all before: It's just fine for the odd, well-lit selfie or Skype call. 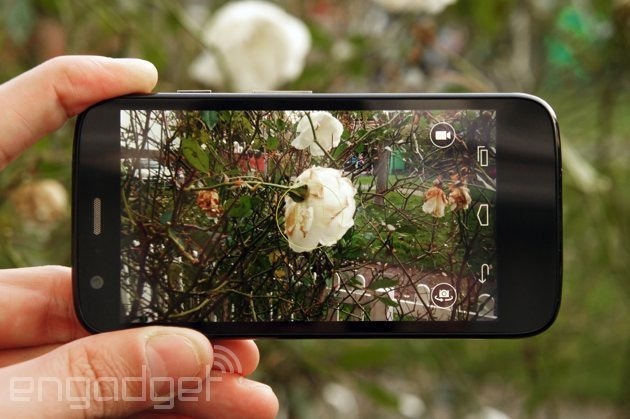 As we mentioned, the G comes loaded with Motorola's own camera app, and it's incredibly simple. The menu panel, easily accessed with an inward swipe from the left bezel, is sparse. It contains HDR, flash, focus control, geotag and sound recording (in video) toggles, as well as switches for the aspect ratio, and panoramic or slow-mo video recording modes. Not having the power to tinker with ISO, white balance et al is quite refreshing, as you can happily snap away without that inkling you might get better results with appropriate investment in the settings panel. And, better yet, you can actually trust the Moto G's automated settings to deliver. The images the G spits out might not have the clarity of 10-megapixel pictures from the Moto X, but they're certainly comparable in quality. 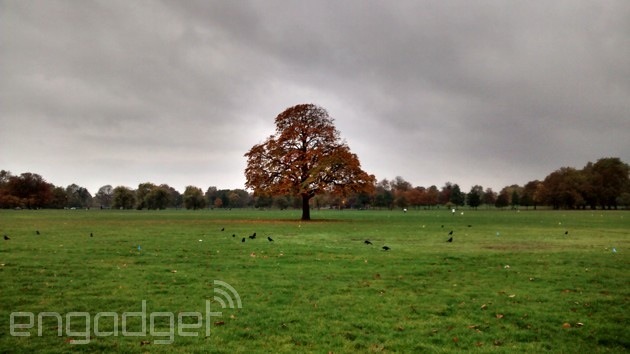 HDR mode has a notable impact, and we found ourselves using this setting quite often. It gives that extra "pop" to colors HDR should, turning some otherwise mundane landscapes into dramatic scenes. The auto light metering and exposure can be a tad off the mark occasionally, but we found it easy to compensate by turning the focus control on or off, depending on the circumstances. We were extremely surprised by the low-light performance. The sensor sucked up every bit of ambient light it could manage, and didn't falter even when faced with brutally dark challenges. The end result often looks way better in the gallery than it does in the viewfinder, too. Shutter response is almost instant under normal conditions, but HDR or low-light shots can extend that to more than a second. Burst-capture mode, which is triggered by holding down on the screen as opposed to tapping for single shots, also takes a second to start up; it'll snap three to four shots per second thereafter. As good as the camera is, it sometimes struggles to focus in macro shots, or when pushed to its low-light limit. The LED companion flash washes images out with its power, and the guide light creates similar problems for the autofocus. Video recording (720p) is a little disappointing, too. The sensor still gobbles up a lot of light, but clips are noisy when stationary and significantly worse with motion. Focus and light metering are inconsistent, and audio quality is average. On the up side, recording begins as quickly as you hit the video icon, and the quarter-speed slow-mo feature is pretty neat. Well, when you're viewing clips on the 4.5-inch display, anyway. Performance: the judging criteria every budget handset dreads. Luckily, rather than opting for a several-year-old chipset to help profit margins, Motorola chose the spritely quad-core 1.2GHz version of Qualcomm's Snapdragon 400 SoC (Adreno 305 GPU), paired with 1GB of RAM. The Moto G is the first handset we've reviewed with a quad-core 400, and in the words of our own Ben Gilbert: "It's bananas." In short, this does not perform like a $179 phone. The speed at which you can cycle through the app drawer is the first indication of the G's quad-core competence. Perhaps it's not quite as responsive as some higher-end handsets with bigger, badder Snapdragons, but it's close enough. Most apps load in a second or less, though larger games took longer, as you'd expect. It is possible to confuse the phone into stuttering and hanging momentarily, if you're jerks like us and rapidly switch between menus, apps and the home screen in a completely unrealistic usage scenario. The G performs well already, but should only improve with KitKat, given Google's optimized Android 4.4 for lower-end handsets -- a term we're hesitant to even use when describing the Moto G.
One way we really like to challenge handsets is with an old-fashioned gaming session, and sure enough, the Moto G's got some mettle. We started off with a few quarters of NBA Jam. Our three-pointer percentage wasn't the best, but the G handled it with ease. That Snapdragon 400 didn't even break a sweat during an online multiplayer round of Shadowgun: DeadZone (on the highest graphics setting, no less). Next, we hit the tarmac in Real Racing 3, which has taken some smartphones out of their comfort zones in the past. We gave up trying to find the phone's breaking point after a few smooth laps. If it dropped any frames, it wasn't noticeable, so we headed back into Tiny Death Star to restock our levels, and called it a day. 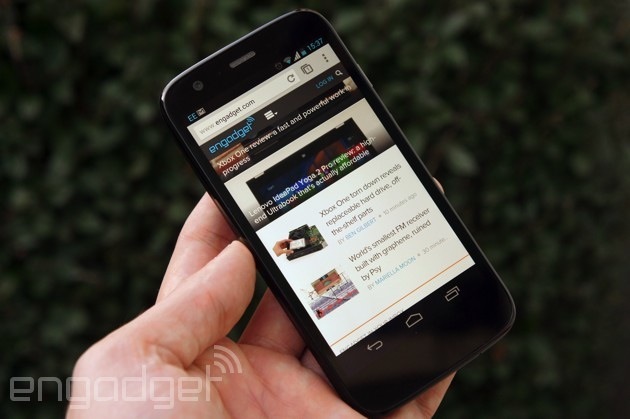 After being thoroughly impressed with the Moto G's gaming prowess, we were puzzled by hiccups with web browsing. Mobile and desktop sites loaded extremely quickly on good connections, and we didn't have any problems with tiling. What we noticed, however, was a perceptible lag while navigating up, down and around web pages. It's not a huge turnoff -- the delays are fairly minor -- but nonetheless, this isn't something we were expecting. Our standard benchmarks show the age of the Moto X's dual-core Snapdragon S4 Pro, in that the Moto G's quad-core Snapdragon 400 SoC produces comparable stats, even besting the X's score in CF-Bench (which measures processor/memory performance). The Moto G tests remarkably well against the Nexus 5, considering that handset packs a top-of-the-line Snapdragon 800 chip. When stacked up against the miniaturized HTC One and Galaxy S 4, the Moto G outperforms both substantially in some tests, and takes a minor beating in others. This tells us that while the G's quad-core 1.2GHz Snapdragon 400 may be better equipped for some tasks, the dual-core 1.7GHz 400 variant used in the other two phones is far from inferior. The Moto G comes with either 8GB or 16GB of built-in storage. On the 8GB model we tested, only 5.52GB was user-accessible. That fills up pretty quickly, especially when you're taking a ton of pictures, installing lots of apps and transferring over music and movies. It's just something you'll have to live with, we're afraid -- and it's also part of the reason the device is priced so low. One consolation is that Google is giving away 50GB of free Google Drive space for two years (that's a total of 65GB when combined with the 15GB you'll receive just by dint of having a Gmail account). Still, it's no substitute for on-board storage, as you can't, say, run applications from Google Drive. If you stream most audio and video content from the cloud, though, or have a PC that you can use to manage handset space effectively, you'll get by as I did. The whole Moto G package considered, a microSD slot would've just been the cherry on top of the icing, on top of the cake. There's more to a phone than just the specs, and all the other chips and bits are sometimes an afterthought in bargain handsets. We could have easily forgiven the Moto G for similar violations, but we don't need to. GPS location is fast and accurate, and the Bluetooth 4.0 module pairs with devices as quickly as it discovers them (that's quick, if you hadn't figured). The G's WiFi chip establishes strong, consistent connections and offers better-than-average range, even though you'll quickly see your bars drop as you move away from the router. Listening to music on the Moto G is a pleasurable experience; audio quality is crisp and you won't be left wanting for volume, but even with a decent set of headphones, bass junkies will miss that rich, low-frequency range. The loudspeaker isn't terrible, but it's not far off. Still, it's fine for hands-free calling. It'll come as a punch to the gut for some: The Moto G doesn't have an LTE chip, so HSPA+ is as good as it gets (GSM/UMTS and CDMA models take care of all the bands). In the South London area where we conducted testing, download speeds averaged around 5.5 Mbps, with upload speeds ranging between 2 Mbps and 2.5 Mbps. We're sure it's capable of much more, but we're testing it on a congested network in a capital city, so that's all we could squeeze out of it. The Moto G is intended for the global market, so we doubt Motorola considered LTE a priority when a significant demographic of potential buyers doesn't have access to 4G networks. Plus, an LTE chip could have increased the device's price, and might have also taken a toll on battery life. Speaking of the sort, the Moto G's 2,070mAh battery is non-removable, and is nothing to write home about, either. It'll support you through a full day of moderate to busy use, but no further. It performed as such in our standard battery rundown test, looping a 720p video at 50 percent brightness for seven hours and 48 minutes before blacking out. That's about 30 minutes more than the Nexus 5 lasted, and it's slightly better than average in the grand scheme, but we don't recommend going on a weekend hiking trip without a portable charger for topping up. You know, in case you need to call for help when a bear mauls your pal, or something. We've already compared the Moto G to a couple of handsets with similar chipsets, but it's a little hard to call them "competitors," as such. An unlocked version of the HTC One mini retails on Amazon for more than twice the price of a 16GB Moto G. A Galaxy S4 Mini is closer in price, but we're not convinced an LTE chip and microSD slot is worth the $150 markup. The two-generations-old Galaxy S II is selling for more than the 16GB Moto G, and we could list plenty of other old handsets that cost more, despite their age. Looking at Android smartphones in the same price range, the options are limited, and not particularly attractive, either. You could, of course, buy something from an unknown manufacturer on eBay, but we'd wager the Moto G offers higher quality and better specs. It's a similar situation with phones currently being offered on prepaid plans. The Samsung Galaxy Express on AT&T ($250), the Alcatel One Touch Fierce on T-Mobile ($210) and the HTC One SV on Boost Mobile (pre-owned; $200) all have two things in common. They are more expensive than the Moto G, and a generation behind it. At the moment, the G really stands alone. We've said it in so many words before, but the price is what makes the Moto G a ridiculous proposition. It's just launched in the US in time for the holidays with an unlocked price of $179 for the 8GB model and $199 for the 16GB version. Verizon, for one, has confirmed it will sell the G with prepaid plans starting early next year, while Canada's Telus will offer it for free on a two-year contract. In the UK, you'll be able to pick up an unlocked 8GB model for £135 or a 16GB variant for £160 when they become available. Right now, Phones4u will give you an 8GB Moto G for free on-contract starting at £11 per month, or a one-off £120 payment for a pay-as-you-go unit. 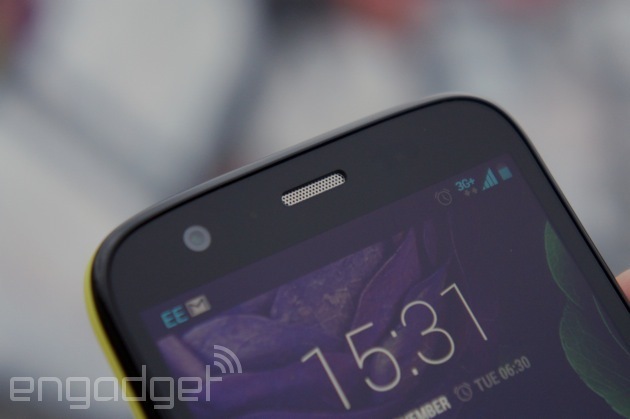 Although currently out of stock, Tesco Mobile was selling the 8GB model off-contract for £99. You could actually pick one up for the equivalent of £50 (around $80) using Tesco's Clubcard points, which is a crazy deal. If you're even considering springing for a Moto G, stop thinking and just do it. Is the G the best phone you can buy? No, it's not. You won't win any National Geographic competitions with the camera, and the amount of on-board storage is a concern when there's no microSD expansion slot. The lack of LTE, too, is sure to put off customers who would've jumped at the handset otherwise. We'll have to wait and see whether any other phone makers can respond to the G and address what's missing, but for now, it stands alone. The carefully built handset is a great all-rounder, with particular credit going to the 720p display and hardware performance. Google has managed to repeat what it did with the Nexus 5: The Moto G is quite simply the best phone on the market in its price range. Daniel Orren contributed to this review.